Can you believe that it's been a year since my sister's cupcake-filled 21st birthday? No, me neither. This year, my sister's birthday fell the day before her last university exam. Not her last exam for this semester, or even last exam for this year, but the very last exam for her degree. She is officially (or unofficially, I suppose, seeing as exams need to be marked) finished with university - at least for the time being. We celebrated her birthday a day late, and it felt like an occasion for lots of celebration. My contributions to birthday food were the strawberry white chocolate truffle balls I made to welcome this same sister home from European travelling, back in 2011. I have made them a few times since that first occasion, and they are always well received. They're what I like to think of as 'faux' vegan food - the ingredients are refined, sugar-filled and not exactly natural - but every now and then they are a welcome treat. Birthdays are a perfect time to pull them out. I also provided fruit, which balanced out the sweetness somewhat, albeit in a sweet kind of way! 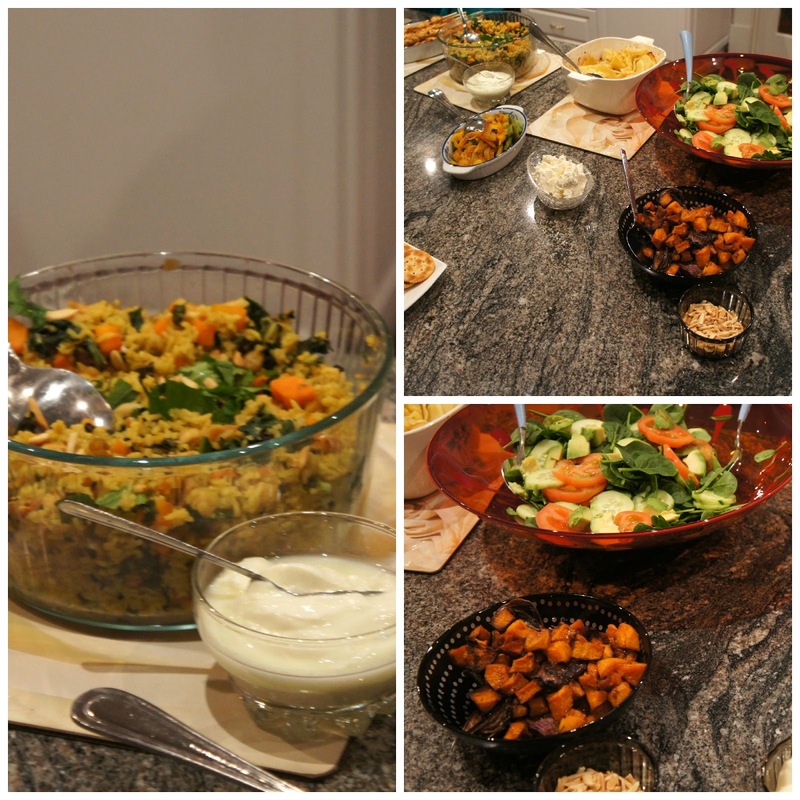 As one of a variety of dishes, my Mum made a chickpea pilaf which I have borrowed the recipe to note down and post here. It was delicious. The dish included turmeric and curry powder, along with chickpeas (of course), currants, slivered almonds, coriander and mint. I am posting the recipe below, which is apparently a Sanitarium provided dish clipped from a newspaper. My sister had two birthday cakes this year, a chocolate one on her birthday and a lemon and poppy seed one last night. Last night's had the privilege of being topped with Terry's chocolate orange pieces, which was a bonus for Mr Bite, who loves that form of chocolate. I find it odd to have a sister old enough to enjoy lemon and poppy seed cake, as opposed to a plain vanilla or chocolate cake decorated with as many lollies as can be squeezed onto one Women's Weekly birthday cake - but that seems to be the nature of getting old. Everything changes, cakes included. Around good food and good company, we also enjoyed the warmth of my parent's fireplace. By the end of the night, I had removed my scarf and jacket, rolled up my sleeves, and was still a little warm. I think I need a fireplace at home! Heat oil in a large saucepan over medium heat. Add the rice, carrots, leek, garlic, currants and spices. Cook, stirring occasionally, for 5 minutes until vegetables are just tender. Add chickpeas, stock and water, bring to the boil, and then reduce heat to low. Cook, covered, for 12 minutes. Remove the saucepan from the heat, place spinach on top of the rice mixture, and cover and allow to stand for 8 to 10 minutes. Add 3/4 cup of the almond slivers, the coriander and the mint. Stir through. Serve topped with the remaining 1/4 cup almonds and additional coriander. How have your birthday cake tastes changed with time? Happy birthday to your sister!! It is crazy how time flies. This chickpea salad sounds crazy good...as do all of her cakes and treats! It was all pretty delicious :-) And yes - time is going faster and faster with age. Crazy indeed! love the look of that pilaf. We never had the Lolly Shop one - it sounds like it's for the best, for my Mum's sanity! - but we had so many of the others :-) Carrot cake is a favourite of mine now too! Surely it is a good thing if time flies and life just feels like lots of birthdays and birthday cakes :-) What timing for your sister's birthday - sounds like a good one (hope the tutors are kind and give her high birthday marks for her course!) and the pilaf sounds delicious - just the sort of thing I never make and probably should. Zooming from one birthday / cake to the next is quite a nice way to think of life :-) And such perfect timing this year, I can remember the thrill of being done with a degree and it is quite a feeling. I'm going to try and recreate the pilaf and hope to make it a regular dish - it had so much I like in it but like you, I rarely make this sort of dish myself. I love truffles! Yours, of course, looked amazing. I really wanted a poppy seed layer on our wedding cake, but my hubby said no. I was sad. I love poppy seed! I hope you're making up for the poppy seed deprivation post-marriage! Now I'm curious as to what you had for your cake instead?! What a relief for your sister to be finished her studies. Time does go by so quickly, I remember when I finished mine and it seems like a blink ago. Love the delicious food!! Chocolate orange :) Delish! It seems like a blink ago for me too, except when I realise my little sister is now finished, and then I feel very old! Your truffles look gorgeous, definitely worth the splurge on refined ingredients! The pilaf sounds lovely, it wouldn't be well received by my fellows but I like trying out these sorts of recipes for larger gatherings. I like your sisters taste in cakes, I made a lemon poppyseed one last weekend and it was gone in 2 days! 2 days! That is impressive given your usual lack of enthusiasm for sweet dishes! Did it win you around too or were your two men particularly hungry (or perhaps others helped you out :-) )? Happy birthday to your sister :) My tastes have changed and yet they haven't in a weird way. I actually have never been a huge cake person, mostly because I hated the frostings on traditional cakes- too sugary and buttery for me. Now I like cakes but prefer the raw kind- cashew, avocado and coconut oil- mmmm those are the best cake ingredients in my book! Mmm, those ingredients do make some delicious things :-) I was definitely a child that liked sugary frostings so my tastes have changed quite a bit - these days the frosting is the least exciting part, unless it's made with the ingredients you mention! Happy belated birthday to your sister. I really fancy a piece of the cake with the chocolate orange pieces on top - it looks superb.